taylor creative inc | weddings: taylor creative weddings debuts the bridal collection! taylor creative weddings debuts the bridal collection! Taylor Creative kicked off the start of wedding season this week with our very first Bridal Showcase! After taking part in so many different bridal events this year (six to date in 2010! ), we decided that the best way for us to reach out to all of our favorite clients, planners and bloggers was to host our own – and ta-daaa, the Taylor Creative Bridal Showcase was born! We transformed our showroom into a boutique ballroom complete with a sampling of bridal vignettes – the sweetheart table, the modern bar, the after-party lounge, and the outdoor garden party, just to name a few. As a part of our outreach to our private bridal clients, we have created a brand new Bridal Collection that is targeted exclusively for the DIY bride or brides who are interested in adding some unique elements to their wedding but may not be working directly with a planner. This very tailored collection will be made up of our favorite and most popular pieces. We realize that for people who aren’t in the industry, our vast collection of products can be slightly overwhelming. While our new weddings website has helped our brides to visualize the possibilities that these pieces represent, we really want to present them with a set of options that are tailored for their needs. The pieces in this collection will be available in all three locations and will include lounge pieces, chandeliers, tables, chairs, chandeliers and lighting options, bars and some of our favorite accessories. Of course, our other products will be available as well for any brides that want to mix in additional elements but this will be a mainstay of our collection which we can offer to our newly engaged clients. We'll be implementing a PDF of the collection on the website in the next few weeks - in the meantime, you can always email us at weddings@taylorcreativeinc.com to receive a copy! You can browse through all the photos from our showcase event below. We will also be introducing some new products to our inventory this fall so be sure to check back next week for a post on all of our fabulous new finds! 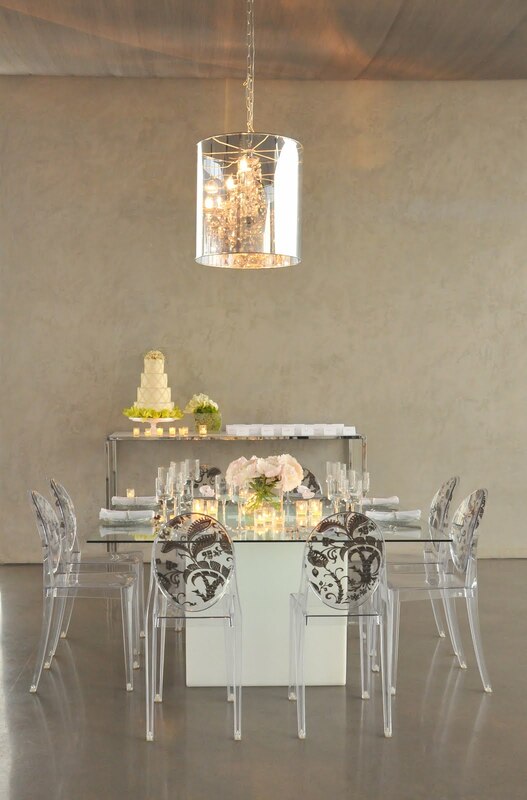 Our Madison Banquettes and Louis Ghost chairs surround the glowing Hourglass Table - perfect for the bridal party or head table. Mixing textures adds an aesthetic appeal to any lounge area. The honey-comb design of the Softwalls offer a rippled background for the lush tufted ottomans and sofas. 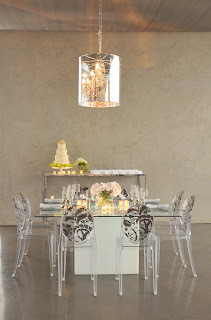 Mix in the colors of your big day with our accent chairs and accessories. Shown here are the colored Panton chairs with our white Avalon collection - perfect relaxing in outdoor style.